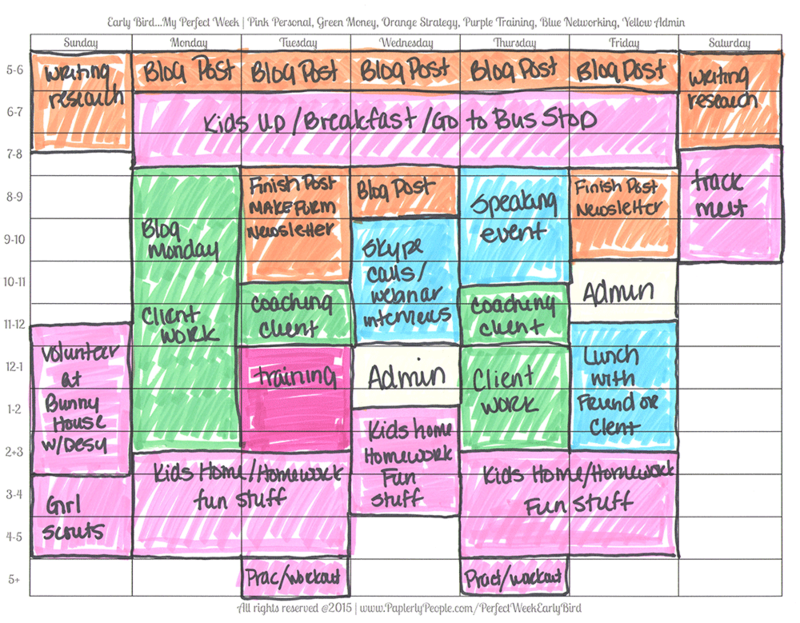 A fun template for your business planning! 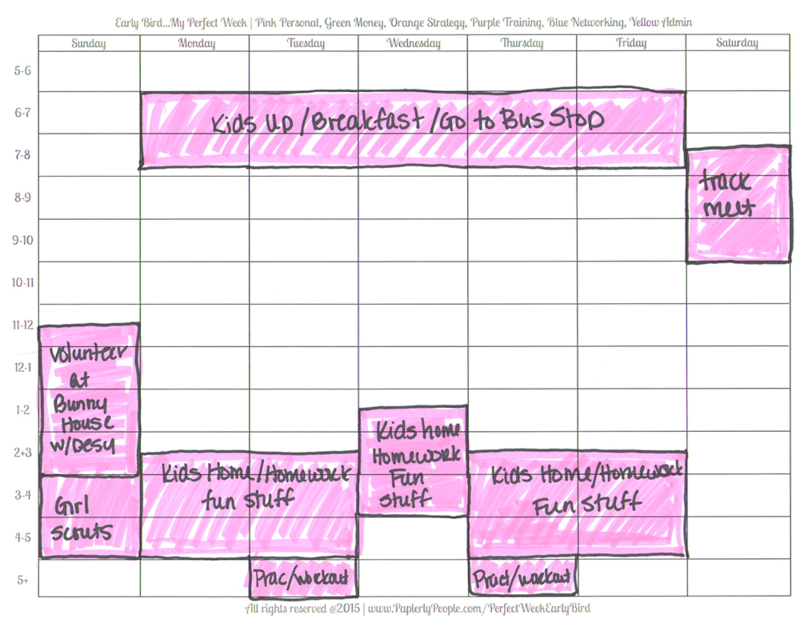 An example layout of how I do my “perfect week” plan for my small business. 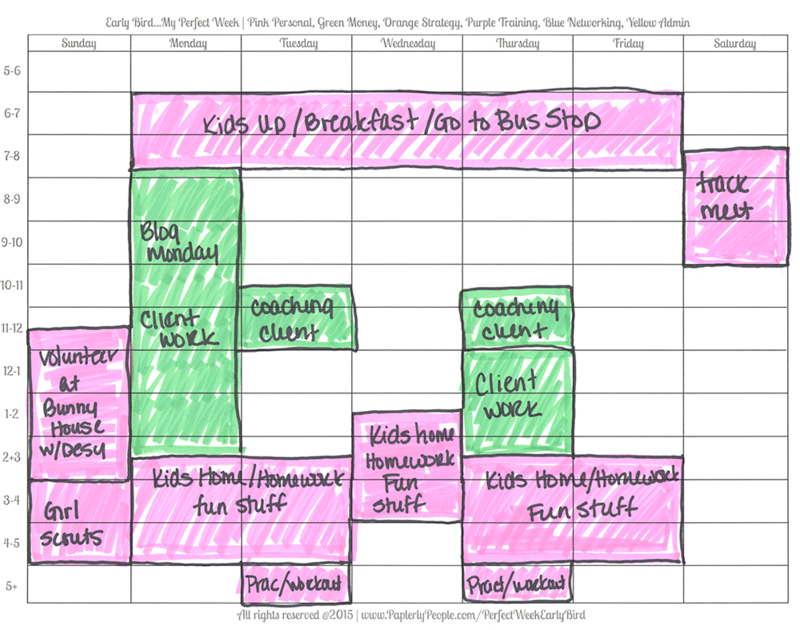 How to make a manageable business week! If you are a small business owner, sole proprietor or other hard working entrepreneur you have figured out something I am sure… that there is never enough time to get everything done. And that is okay. That is part of being a entrepreneur! What is not okay is beating up on yourself and thinking that it is your “fault” that you don’t have enough time. Having lots of work means that you are striving towards success and motivated to be great. So cool. That said, it is possible for you to get out from under the burden of feeling bad about your time with a few simple steps. When you are drowning in work it can seem like there has to be some kind of lifeline that you can grab. That you can just read the right book or find the right planner and magically all your troubles will be fixed. Believe me I KNOW. I have been working on my time management for YEARS! In the past I had limitless time because I was married to a workaholic too and I could squeeze having a life around the few personal things I needed to do. Then we adopted three kids and all of a sudden my limitless time became, well, limited. Those pesky little creatures do not find Mom on the computer all day to be amusing. They want to walk to the school bus (50 minutes instead of 15). They have teacher conferences (there goes another hour and a half) and let’s not even talk about homework (another couple of hours a day). Now your time problems might not be kid related, they maybe family related, or you might like to work out obsessively like my friend Kir or you might volunteer passionately for a cause you believe in IN ADDITION to your crazy, busy business. Okay, if you are like my husband, you are stressing out right now thinking there is no “perfect week”. That every day something happens or something changes. Yes, you are RIGHT! There is no perfect week, but it is important to make sure that ALL of what you have to do will actually fit into the time you have. There is no magical time dimension where you can have kids, friends, family, pets, volunteer AND work 120 hours a week. THAT is the myth of time management. 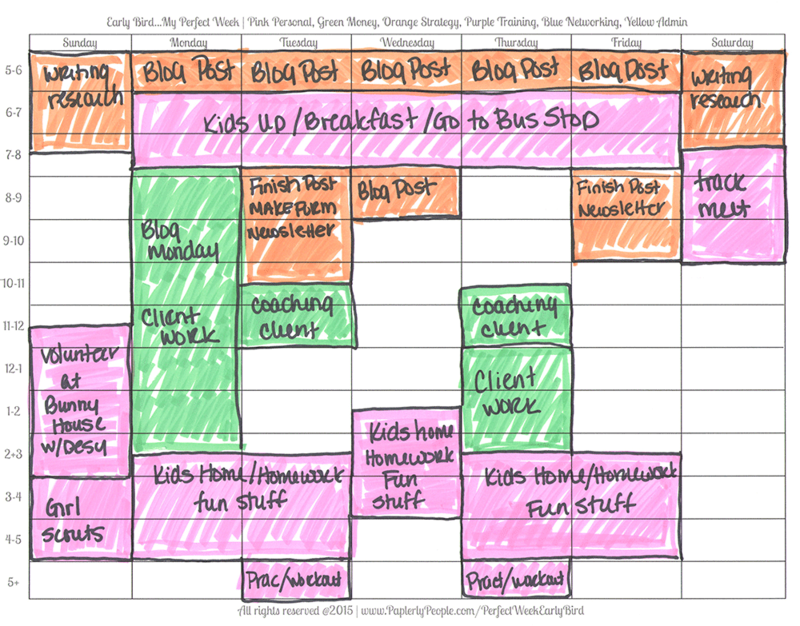 That you can find a system that will make too many tasks fit into too little time. 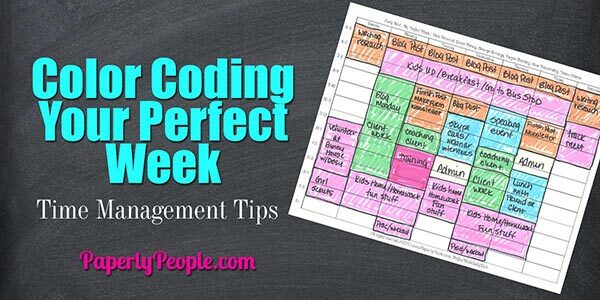 This “perfect week” plan is just a way to make sure that you are being at least a little realistic with what you could accomplish if everything worked just the way it was supposed to! I made a Perfect Week Form that you could use, or you can just draw it on a piece of paper or use one of your weekly planner spreads. 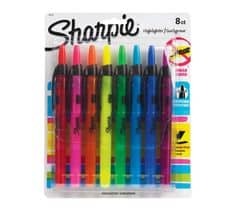 Please note, when I am doing it for myself I tend to write in pencil so I can move stuff around, I did it in big sharpie marker to make it easy for you to see! Figure out what you want to do outside of work first. Write down a list of things that you like to do that are not work related. They can be shopping or gardening, working on cars or going to your kid’s ballgames. No one but you gets a vote and there is nothing that is “too stupid” to like to do. If you REALLY like to get your nails done, then put that down. On a blank calendar page, fill in all the time that doing those things will take. I like to use pink for personal to shade these in… so FIRST goes pink for personal! If you are truly stressed out about getting everything done in your business then this step is going to FREAK YOU OUT! You just barely have time to get everything done and now I am suggesting that you do something frivolous like go to Estate Sales? Yep! There is a saying, never off, never on. If you are working 24/7 just to keep your head above water, you are not being effective. It is only when you step outside of that prison of work you have built and smell the fresh air of freedom for a couple of hours that your brain starts firing on all cylinders again! 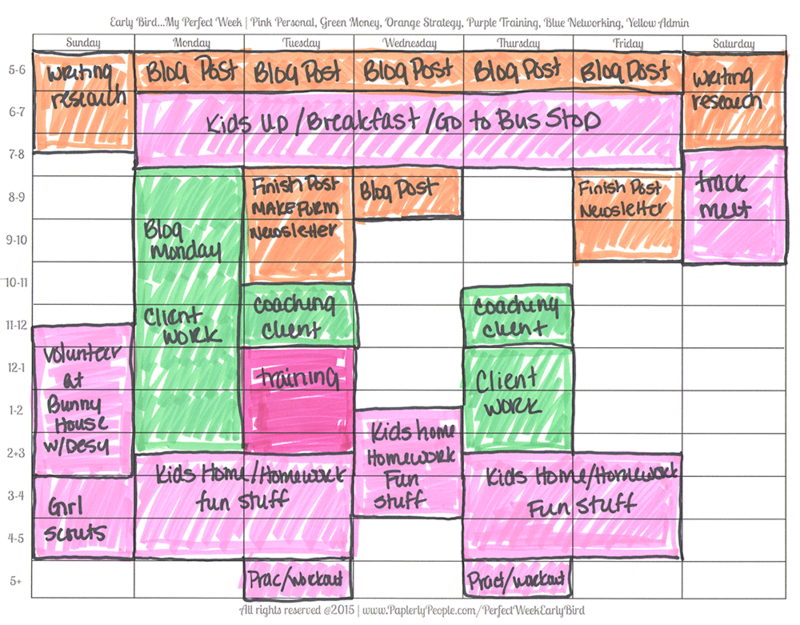 The next thing you need to do is schedule time to do “work work”. If you are a service worker like me, you can schedule all your client work in on one big long day or if you are retail or consumer based you will need to put in the hours you work for customers. This is work that you are paid to do! No volunteer or “paying it forward” time goes here, simply things that you are paid money by other people to do. If you are doing spec work or volunteering your time you can put it in either personal or networking. This is where I see kind hearted, generous people blow up! Say you are “helping out” a friend making her a website or you are doing some free work to try to win a new client. All of that takes away from your personal or money making time. If you have extra hours in the day left over to fit these things in, great, but if you are stressed for time you need to rigidly schedule for this and limit yourself to “helping” only as much as you can afford time-wise. I am contractually obligated to do client work at least part of my week (they pay me and I promise to deliver). If you are paid for something owed to someone else, I feel like this has to be on your calendar prominently. PLUS it is bringing money in the door which is the whole point! So the next thing to fill in is your strategy time. This is for when you are working ON your business and not IN your business. For me strategy includes writing blog posts (these bring in readers like you who buy my stuff), making new courses to sell or calendaring my work. Strategy is where I see the most entrepreneurs fall apart or avoid. They are so busy doing, doing, doing that they never stop and figure out what are the BEST things they can be doing. You will see I have strategy every work day! This is because it is what will make my future better. Running on the hamster wheel isn’t much fun so I make sure that every day I am doing something to move my business forward. Some of my clients who do focused lead generating at a certain time each day use orange for that too…it is the color of the future! You NEED to learn new things! If you are using the same tools and techniques that you have been using for years, you are probably stale and out of date! Training can include formal classes, watching webinars or reading blog posts. It is VITAL that you keep new ideas coming into your business AND that you schedule time to learn. If you don’t you are back to the grind with nothing stupendous ever to look forward to! If you do your lead generating with networking, you should have A LOT blue there. That said, if you are running out to do “one on ones” frequently, make sure that you add the travel time to your front and back end. Yes it is just half an hour, but if you are driving to and from, it can eat up considerable time. I found that I could schedule one on ones around networking events or do them on Skype to save time. You can also use blue for your speaking events! This is a time when you are out of the house and meeting new people. You can also put masterminds and lunch with clients there. Not really lead generating, but definitely out of the house and and meeting people! Last but not least are things you have to do like pay bills, update your credit cards, fill out forms for your office or partners, etc. There is a super funny thing that goes on here that I never understood. Some of my friends are wicked focused lead generators and block out two hours a day for lead gen. I was always wondering how they got things done that HAD to be done like the admin work. It seemed like they didn’t care about it! Well, let’s be honest, it will get done sometime and it is the least important part of your business. For example, I do my bills on the 15th of every month. NOTHING happens with them except on that day. No trips to the bank to deposit checks, no random payments here and there I have to track, just one hour, one time a month and everything is done. When you see it in color like you just did, you will see that time you think you had to use was actually not necessary OR maybe you need an assistant to handle things like chasing payments and setting up basic client information. As an entrepreneur or small business owner, Admin HAS to be the last on your list or you will never move forward! As you do this process, you will probably feel a little uncomfortable and think that this is the dumbest thing you have ever heard of! THAT IS THE PROBLEM, not the filling out the time management form. Until you see it all laid out there for you in black and white and color, you are just beating yourself up thinking that there has to be a system or plan that you could use to make it work better. But for most of us the problem is that we are trying to squeeze a size 16 business into size 2 jeans. It will just never fit and you are destined to being behind ALL OF THE TIME. Really look at what you have on your plate and try to figure out if there are places that you can trim things off or move them around until they actually fit! 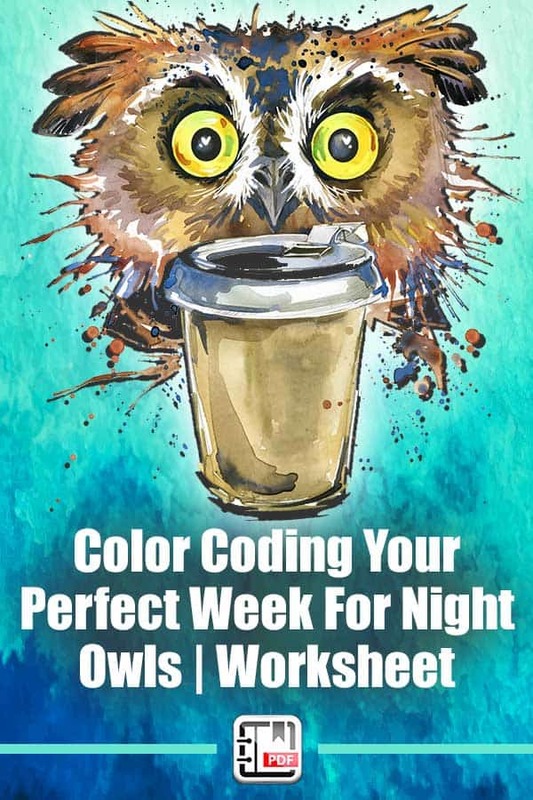 When I do this for real, I tend to do two or three different perfect week forms, one when I am out of town speaking to see what I HAVE to do, one like this that is a perfect work week and one where I am in huge production mode and ignoring the rest of the world. You might have to have one for when you are working and one for when your kids are off of school. Or one for when you have to work at a job part time and then when you are off. Everyone’s is different depending on their life and their focus. As I said, you can do this process on a scrap piece of paper, in a blank planner spread OR you could get a copy of this form that I used on my Etsy store! For each of these types of forms I make a Word Document that includes this post and a video walkthrough that shows you how I use this form! 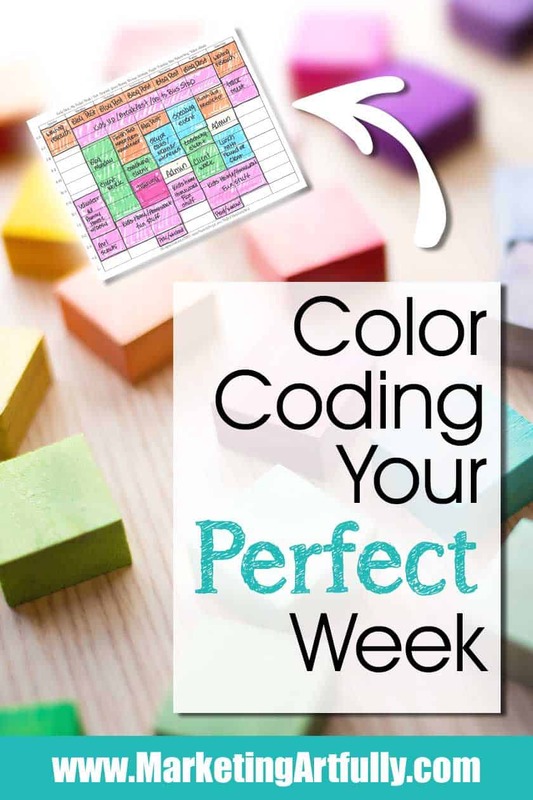 If you would like to find out more about my Printable Planners forms or Color Coding Your Perfect Week check out these forms!